by the Apollo mission astronauts in the late 1960s and early 1970s. The closest Full Moon, and hence, the largest so-called “Super-Moon” in nearly 70 years will be visible throughout the overnight periods of both Sunday night / Monday morning (Nov. 13-14) and Monday night / Tuesday morning (Nov. 14-15). Particularly since the Apollo missions to the Moon of the late 1960s and early 1970s, accurately measuring the distance between Earth and the Moon has been possible using lasers. The November Full Moon will be the second of three "Super-Moons" in a row this year, with the third coming on December 14; however the November Full Moon is by-far the closest and brightest. Due to the very close proximity of the Full Moon to the Earth on November 14, the term “Super-Moon” may be the most valid of the many times the term has been used over the last few years. The reason a “Super-Moon” is so close, and appears so large, is because this is known as a perigee (or perigean) Full Moon—when lunar perigee and a Full Moon occur near the same time, at least within a 24-hour period. Due to the Moon's ellipitical orbit around the Earth, perigee is the closest point in the orbit that the Moon approaches the Earth each month (actually, every 27.32166 days). Apogee is the Moon's farthest point in the lunar orbit from the Earth. From the point of apogee to the point of perigee, the Moon can be as much as 14 per-cent closer to the Earth (approximately 30,000 miles / 48,280 kilometers closer), and appear 30 per-cent brighter. The near-Full Moon reaches the closest perigee for 2016 (and, actually, closest since1948) on Monday Morning, 2016 November 14 at 6:23 a.m. Eastern Standard Time (EST) / 11:23 Coordinated Universal Time (UTC). Then just two-and-one-half hours later, Full Moon occurs at 8:52 a.m. EST / 13:52 UTC. Since both lunar perigee and Full Moon occur during the mid-morning hours of Monday, this “Super-Moon” should be visible, weather-permitting, during the overnight periods of both Sunday and Monday. For areas where inclement weather precludes viewing the “Super-Moon” outdoors, there will be a couple Internet Web-Casts during these evenings where the “Super-Moon” can be seen (links to these Internet Web-Casts at the end of this blog-post). You would have to look closely to notice the size difference between this “Super-Moon” and a Full Moon that rises any other time of year. As the Moon always looks a little larger when near the horizon, the best time to view the “Super-Moon” will be just after the moon rises in the east and just before the moon sets in the west. Around the time of the Full Moon phase, the Moon rises shortly before or after the Sun sets, and the Moon sets shortly before or after the Sun rises. At the end of this blog-post is a link to the U.S. Naval Observatory Internet Web Site, where you can determine moon-rise and moon-set times for your locality. Brightness of the “Super-Moon” may be more noticeable than the actual size of the Moon. So, if you cannot notice the larger size, you should be able to notice the greater brightness of this Full Moon. For people who live near an ocean coast-line, the tides may also be much more noticeable. While the Full Moon phase (and the New Moon phase) usually brings higher tides than normal, a “Super-Moon” will bring among the highest tides possible, outside of a hurricane or other major storm. When the Moon does reach perigee, just two-and-one-half hours before Full Moon, the Moon will be 221,524.4224 miles / 356,509 kilometers from the Earth. Scientists have had a new tool to more accurately measure the distances between the Earth and the Moon since 1969. Astronauts on three of the Apollo space missions which landed on the Moon mounted retro-reflectors at each landing site, which allows reflected laser light from an Earth-based laser to accurately measure the Earth--Moon distance at any time an observatory can send and receive a laser pulse. Russia also landed two retro-reflectors, by unmanned space probes, on the Moon. Called Lunar Laser-Ranging Experiments, these experiments actually started in 1962, when a research team from the Massachusetts Institute of Technology (MIT) successfully observed laser pulses reflected from the surface of the Moon, using a laser with a millisecond pulse length. Later the same year, a Russian team from the Crimean Astrophysical Observatory made similar measurements using a Q-switched ruby laser. However, greater accuracy in these distance measurements had to wait until retro-reflectors were placed on the lunar surface. U.S. astronauts mounted retro-reflectors on the Moon during the Apollo 11 (1969 July 21), Apollo 14 (1971 January 31), and Apollo 15 (1971 July 31) missions. Russia (then officially known as the Union of Soviet Socialist Republics) mounted two retro-reflectors on the Moon, via unmanned lunar rovers Lunokhod 1 (1970 November 17) and Lunokhod 2 (1973 January 15). 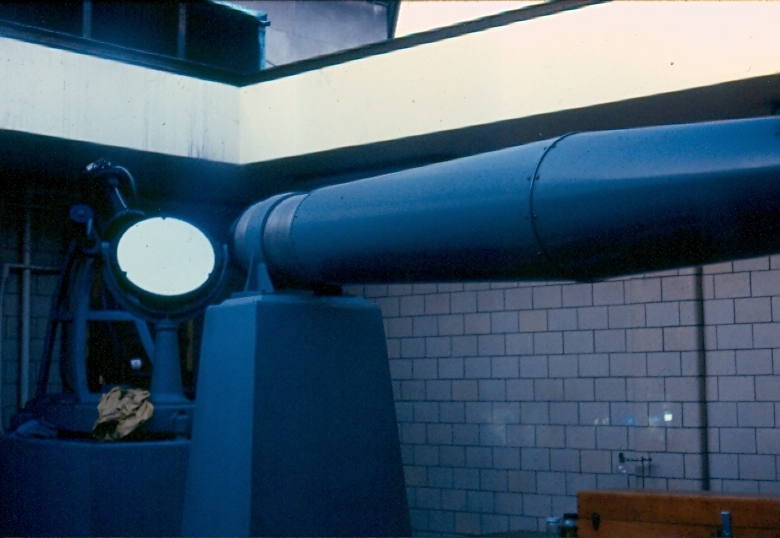 The Lunar Laser-Ranging Experiment from the Apollo 11 mission. After 1971, Lunokhod 1 was lost on the Moon, as lunar laser-ranging experiments had failed to detect a return signal. However, on 2010 March 17, both the Lunokhod 1 lander and rover were found in photographs taken by NASA's Lunar Reconnaissance Orbiter. Starting on 2010 April 22, researchers from the University of California at San Diego, using the Apache Point Observatory Lunar Laser-Ranging Operation (APOLLO) in New Mexico, successfully measured the distance between the Earth and the Lunokhod 1 rover site on the Moon several times. APOLLO researchers continue to use the Lunokhod 1 retro-reflector for lunar laser-ranging experiments because, to their surprise, after nearly 40 years the Lunokhod 1 retro-reflector was returning more light than the other four retro-reflectors on the Moon. Although this month's Full Moon is now regarded as a so-called “Super-Moon,” the Native Americans had other names for the November Full Moon. The Full Moon of November is generally known, in the Northern Hemisphere, as the Beaver Moon. This was the time when Native Americans set-out beaver traps, before creeks and swamps froze-over, to ensure a good supply of warm furs for the coming Winter. Although beavers do not hibernate, by the following month the beavers would be in their lodges for the Winter, difficult for hunters to trap. While most people consider the Full Moon as the Beaver Moon, the Native Americans actually considered the whole Moon cycle (all four Moon phases) as the Beaver Moon (i.e. the Beaver Month for the 27.32166-day lunar cycle). Other researchers believe the Beaver Moon name came from the fact that beavers, themselves, are active building water dams, preparing for Winter at this time of year. For years when the Harvest Moon occurs in October (when the October Full Moon date is closer to the Autumnal Equinox than the September Full Moon date), the November Full Moon is then known as the Hunter's Moon. However, this is not the case this year. NASA. "November Supermoon a Spectacular Sight." 2016 Nov. 9. EarthSky.org . "5 keys to enjoying the closest supermoon." 2016 Nov. 12. Sky & Telescope Magazine. ""SuperMoons": A Unique Observing Challenge." 2016 Nov. 10. "Hunter's Full Moon Another 'Super Moon'." 2015 Oct. 26. "August "Super Moon"." 2015 Aug. 28. ""Mini-Moon": 2015's Smallest Full Moon." 2015 March 5. "Another 'SuperMoon'." 2014 Aug. 9. "Perigee "Super Moon" On May 5-6." 2012 May 3. "'Supermoon' Alert: Biggest Full Moon of 2012 Occurs This Week." 2012 April 30.